I work at SONR Labs, a company that makes Android speaker docks. SONR is a bit of a hybrid between a 20th and 21st century product company. We have a small team, we use free software for design, and we're situated in 1871, a co-working space for 'digital startups'. On the other hand, we still get our products made in "old fashioned" ways, i.e. manufactured in and shipped from China. We like to think we draw on the strengths of both approaches. We have our main product in stores and recently needed to create some signage to help draw attention to our product on the shelf. These are known as point-of-purchase or POP displays in the retail industry. My task was to get 35 professional-looking displays made and shipped out, fast. An international supply chain is great if you need to build and sell thousands of something - but it's no help if you need 35 signs ASAP. Furthermore, 1871 is an excellent community and place to work- but it's set up for "digital" startups - meaning they don't need a lot more space than a laptop and a cup of coffee takes up. We needed a little more elbow room for this project and were lucky enough to get in touch with Zach from Inventables, who generously offered us the use of their workshop for this project. With work space secured, my first step was to come up with a design for the display. We quickly settled on the idea of using bent plastic with printed graphics as the base of the POP. To add a little flair, we decided to attach some 3D-printed Android figurines. I've been a Blender user for a long time, so I dove in and roughed out the shape of the POP, while designing the printed graphics in Inkscape. 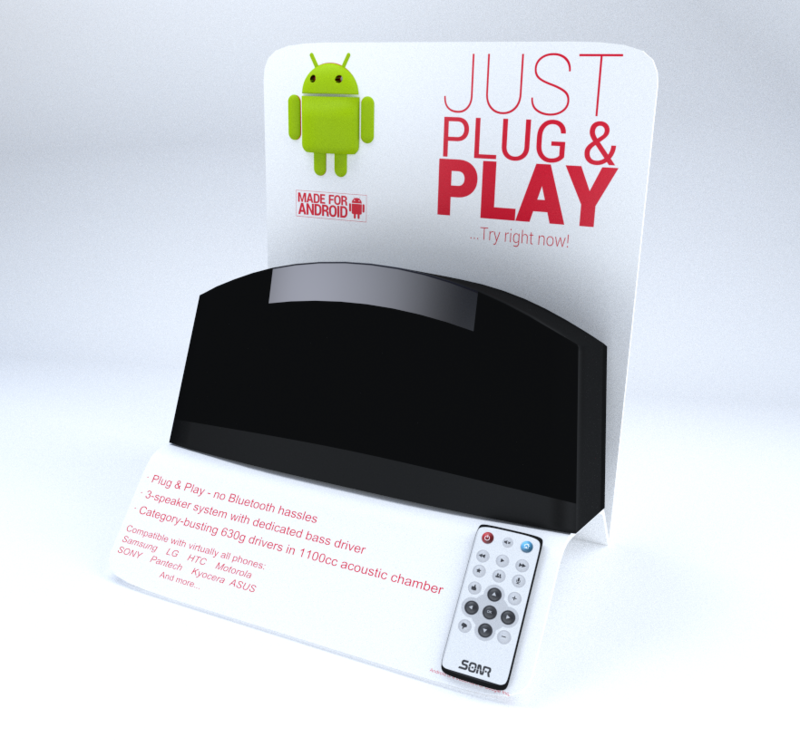 After a couple revisions we had a render of a complete design and a nice Android figurine .STL. We sent the render over to the buyer at the store, and, success! They liked the design and wanted to put it in-store. Now, the fun part. A local print shop made 50 copies of the design (35 for the store now, another 15 for spares) on vinyl, attached to 1/4" thick PVC stock. Meanwhile, we printed out 50 Android figurines on our Replicator 2 - they took about an hour each. I got the exact measurements for the display out of Blender and used a strip heater to bend acrylic sheets into properly-angled jigs. I did 3 bends per PVC piece with the strip heater, taking care not to scorch the material, and used a 1" hole saw to make way for the power cord. Initially I used epoxy to attach the speaker dock, remote control, and figurine to the vinyl facing. BIG MISTAKE. I had assumed epoxy was a serious adhesive for all purposes and surfaces. Turns out this vinyl was an exception. I managed to put together at least 10 full displays before discovering that pieces were spontaneously falling off. The adhesion was remarkably poor. In the end we used double-sided foam tape for the remotes, screws for the speaker dock and Krazy glue for the Androids, all of which turned out pretty darn solid. It was a whirlwind project and Inventables was a central part of it. Now, I don't have a lot of experience successfully building things. I have a woodworking project in my garage that is about 500% over budget and behind schedule. I did build a bike wheel once - and I'll have you know I only had to take it apart 4 times to get it working. Still, in spite of my "abilities", we were able to put together a fair number of high-quality displays for use in real retail stores, in front of real customers. I have to say, the credit belongs mostly to the quality of tools available to makers today, and the community around them that we were able to do this.